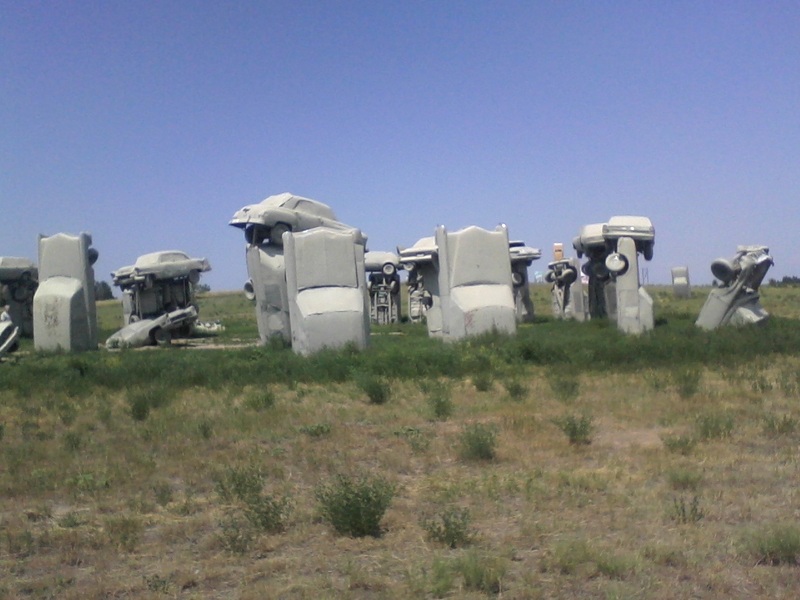 Carhenge: a uniquely American roadside attraction. Carhenge charges no admission and survives on donations and merch sales, so please consider pitching a fiver into the donation jug when you visit, or buying a tee shirt or coffee mug for your favorite car enthusiast. I got to wondering whether there was any script, analytic, or narrative out there that puts this site in context with the perhaps better-known Cadillac Ranch, near Amarillo, because I wasn’t seeing much originality here, other than that the silvery-ness and circularity of Carhenge were more interesting. It turns out that there’s a recent seven minute clip on Vimeo that looks at both of these projects along with another Texan effort known as VW Slug Bug Ranch, near Conway, TX. One point seemed to be that the Cadillac Ranch cars were expected to be annotated by visitors via paint cans, while the Carhenge ones were not. Not my favorite genre or medium in any event, but a different take on flat, for sure. The book Graffiti World has some of the most amazing pieces of art one encounters in 21st century art world. Ya, the artist didn’t attend establishment schools. I know, that wasn’t the point of the post. Stone cars was. This reminds me of the art work that used to be in the parking lot of one of my local malls, in the town next to TR’s Shoreline. It consisted of cars that had been covered with asphalt,semi- randomly at one end of the lot. It looked as if the had just accidentally been left and covered. Very eerie. Alas, 7 or 8 years ago the removed it. One of the great landmarks of my home state of Nebraska! A great reminder (to me at least) of how the boredom of the isolated small town life of the Plains can prompt folks unleash their creativity for lack of anything else to do. Thank you for mentioning Carhenge. I’ve been having a love affair with Google Maps and found that you can put yourself in the middle of Stonehenge. I just tried it with Carhenge and – voila! – it works there, too. Not as good as being there, I know, but since I’m not likely to make it to either place, I think it’s pretty cool to get a glimpse of what it’d be like to be there. If you want to check out one of SE Mich’s odder sights, check out the giant Uniroyal tire off I-94. Something about it cracks me up every time I see it. Maybe imaging the size of the car it would have come off of?